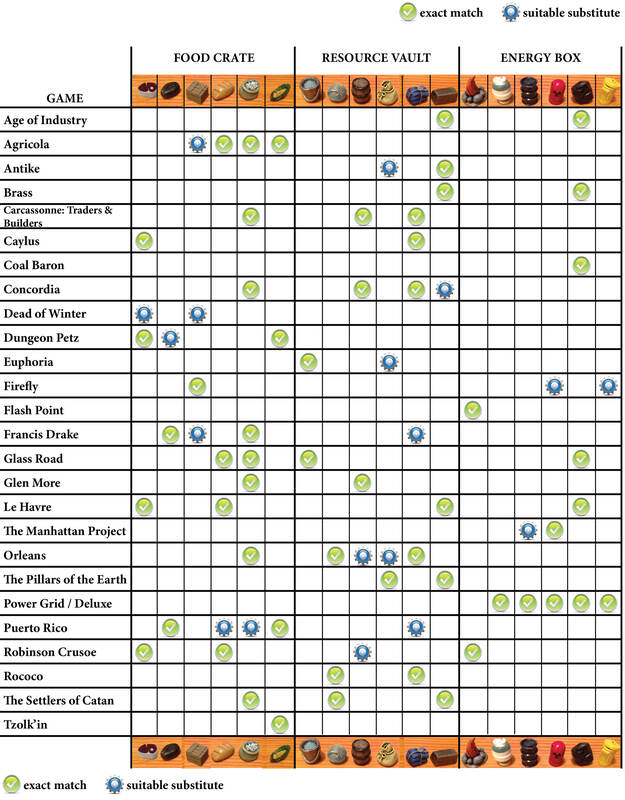 The following charts show some of the most popular games that use these resources. Some of these games include resources that are concealed or drawn randomly from a bag, so their use might depend on how competitively you play. Just a thought on Tzolk’in (and what I’m planning on): the grain bags from the food crate as 5 corn. Hi. I really like the quality of the resources! In the Treasure Chest chart shouldn’t there be a check in the Gold column for Euphoria? I’d love a cannon to use for Francis Drake. The best you can do now is scrounge the internet for cannons from old copies of Risk. You should try Gametrayz.com. The sell the resources in customizable sets. Hi Jamey, Actually Catan uses ore not stone. Also “The Colonies” scenario uses Gems and Gold nuggets. Also from what metal are your ore and gold tokens made of and can I buy them in Europe? Thank you. From what material is the gold? Is the gem from glass? The gold is made out of zinc, and the gem is made out of plastic. How about some suggestions for Anachrony. 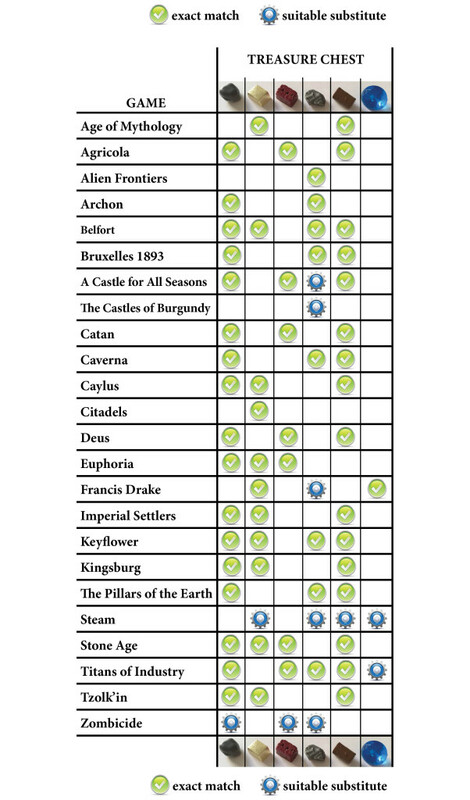 It’s begging for improved tokens, but I’m not sure how to match things out. There are five resources. Water (blue glass blob) 70 or 20 light blue and 10 dark blue (5 water). I just thought I’d add my two cents with regards to the metal coins. The Viticulture set are awesome quality and make a perfect replacement for the coins in Istanbul and Libertalia. Firstly, I wanted to let you know that I have recently bought some of your tokens and I was really impressed by the amount of work that went into the design and production! Also, I wanted to ask you if you are planning to produce some “gold nugget” resources as opposed to just “gold ingots” (which btw they also look nice)? For example, you do have both “ore” and “steel ingots” as separate resources. Thanks Kyrk! I’m glad you like the tokens. There was a point when I thought about making gold nuggets in addition to the gold ingots. They’re pretty expensive to make, though, so it’s only something we could do if a lot of people wanted them–I worry that they’d directly compete (instead of complement) the gold ingots. I do think they’d look cool, though. I see! So they cost much more than the “ore” and the “gold ingot”? Is that 2 times more? If the “gold nuggets” compete with the “gold ingots” wouldn’t that mean that many people would want them? I honestly do not know which games — that require “gold” as a resource — require it in the form of nuggets or ingots. Btw, even in their wooden version, “gold nuggets” are rare! I could only find one place that sells them and they are part of a set. I also think they would look cool and if you ever decide to make them … I will buy them! Cool! Thank you for taking the time to explain this. Good luck with everything!